A fair number of the visitors of this site have the idea that we want to establish settlement on the surface of celestial bodies such as planets or moons. 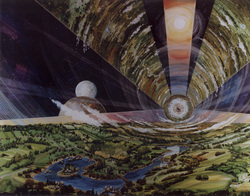 This is however not the case, instead we prefer space habitats in orbit around the Sun, planets or moons. 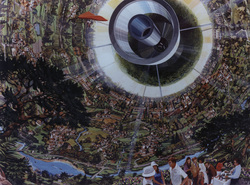 When we use “space settlement”, “space habitat” or “space colony” we always refer to orbital space settlements. 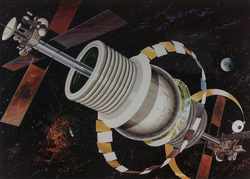 In this sense space habitats are a type of space stations. 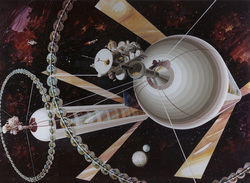 Space habitats differ from other types of space station in that space habitats are designed to house a substantial population, and that space habitats use centrifugation to replace gravity. 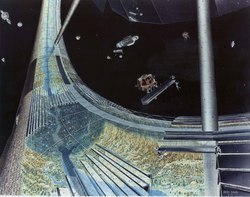 Since we understand that many visitors face difficulties with imagining what orbital space habitats would like, hence we have decided to include several artist impressions of space habitats on this page. 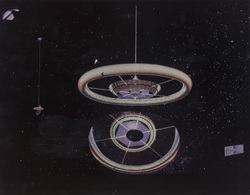 The are several types of space habitats, including dumbbell, torodial, spherical and cylindrical habitats.